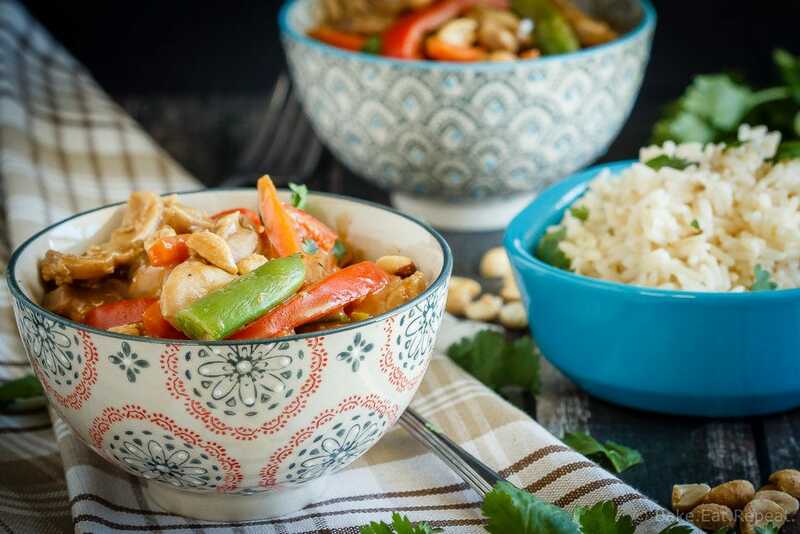 A quick and easy weeknight meal, this peanut chicken stir fry is filled with veggies and an amazing homemade peanut sauce – plus it’s ready in 30 minutes! I have tried many, many different recipes for peanut sauce over the last few years. I knew it could be good, amazing even, but for some reason couldn’t find that perfect recipe. They were always too sweet, too thick, too peanut buttery – too something. But this recipe may finally be it. Perfectly peanut buttery, not too sweet peanut sauce that is hard to stop eating. 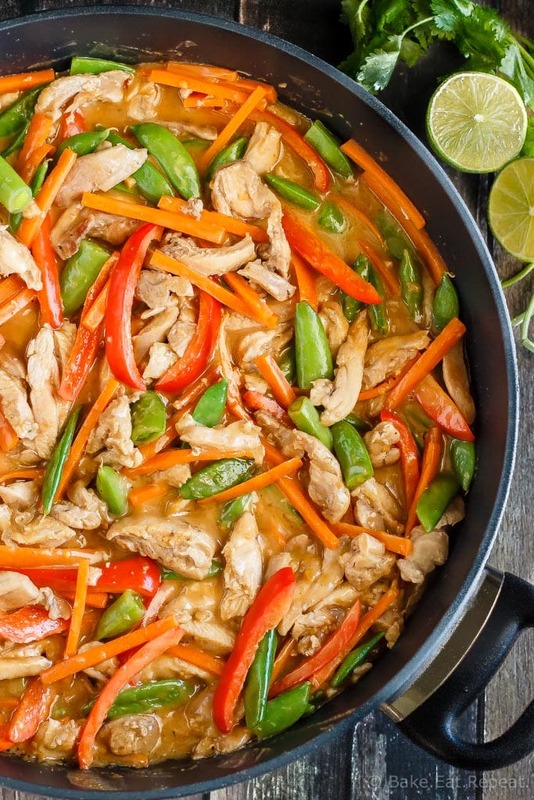 We loved this easy, 30 minute peanut chicken stir fry. Everyone in the family gobbled it up in no time at all – even the kids that typically don’t like saucy stir fry meals. Although I do think that I’m wearing them down – there weren’t even any complaints when this chicken and vegetable smothered in sauce dish appeared on the dinner table. Granted, there was peanut butter involved – but they didn’t know that just for looking. I think this particular meal is going to actually be requested by said kids though, because it was absolutely delicious. There may even have been a slight battle over who got the (very small amount of) leftovers for lunch the next day. I totally won. I should probably make this tasty peanut chicken stir fry again soon! Only 30 minutes and you can have this on the table for dinner! Plus, it’s 30 Minute Thursday again, so scroll down to below the recipe for more tasty 30 minute meals from my blogging friends! make sure to start your rice (or quinoa) first so it’s ready when the stir fry is done – nothing more annoying than having dinner ready and realizing you forgot the rice to go with it! 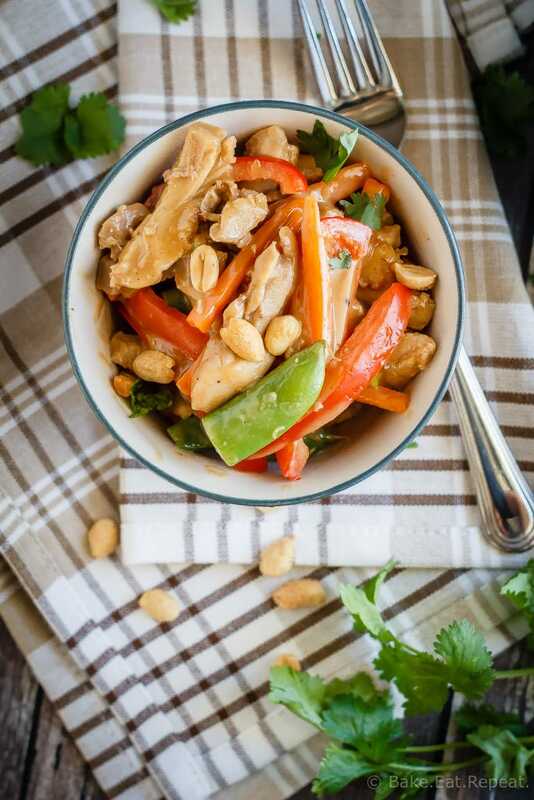 A quick and easy weeknight meal, this peanut chicken stir fry is filled with veggies and an amazing homemade peanut sauce - plus it's ready in 30 minutes! Heat the olive oil in a large non-stick skillet over medium heat. Add the chicken, season with salt and pepper and cook, stirring occasionally for 4-5 minutes or until there is no pink remaining. Meanwhile, whisk together the peanut butter, sesame oil, lime juice, soy sauce, honey, garlic, ginger and red pepper flakes until well combined. Set aside. Once the chicken is cooked through, add the red pepper, carrots and snap peas to the pan and cook, stirring, for 3-4 minutes, or until the veggies are starting to soften. Add the prepared sauce and stir to coat everything. Continue to cook, stirring, for 2-3 minutes until the sauce is hot and bubbling. 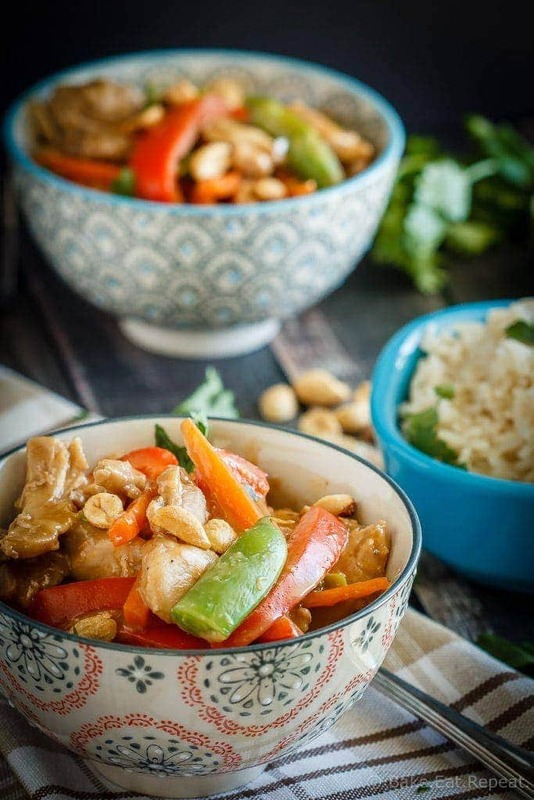 Serve the peanut chicken and vegetables over hot rice, with peanuts, cilantro and green onion to garnish. Make sure to start your rice cooking first so it’s ready when your stir fry is done! I have made this with both chicken breast and chicken thighs and both are fantastic so use your preference. The amount of red pepper flakes called for in the recipe is a range depending on if you like spicy food or not - I use 1/4 teaspoon because my kids hate any spice, but my husband and I add more to our own servings - use 1/2 teaspoon if you want a bit more heat (it still won't be overly spicy). Source: Adapted from Company’s Coming - 30 Minute Weekday Meals . I’ve looked but cannot find the number of servings. Help, please. I've never made my own peanut sauce before, but I definitely need to start after seeing this recipe. I love stir fry, so this is a match made in heaven! What a perfect weeknight meal! I love ANYTHING with peanut butter - savory, sweet, etc. It's all good in my book! Definitely digging this stir fry and all those colorful veggies! Peanut chicken is one of my favorites - love your stir fry version with all the colorful veggies!